All transactions are safe and secure with a reliable history in online purchasing behind each of our associates. 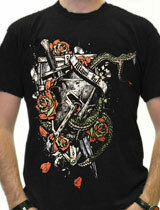 Buy the Miami Ink War Reptile t-shirt to own Miami Ink clothing and merchandise. This dark tee features a reptile design that includes the furious hunter wrapping himself around a gladiator helmet. It is the perfect homage to the TV show Miami Ink. The ferociously dazzling design featured on this Miami Ink t-shirt promotes the artwork of the Miami tattoo shop and is perfect to wear whether you have your own body art or not. The intricate design has a menacing tone. The silver and reds are subtle, yet they effectively grab the attention of the people around you. Pair it with the Kat Von D t-shirt in our gallery. In addition to the Miami Ink War Reptile tee above, browse the Miami Ink Clothing Gallery for more apparel like men's and women's clothes, kids shirts or hoodies.